The Hamilton Beach Juicer Big Mouth Juice Extractor Model 6750 is one of the top juicers according to consumer reports and has a large capacity juicer that can juice many whole fruits and vegetables, but is it the right juicer for you? This juicer is not the cheapest juicer on the market, but is far less expensive than some of the popular Breville or Omega juicers. The quality of it is good for the price, but not up to the quality of some of the best juicers available. 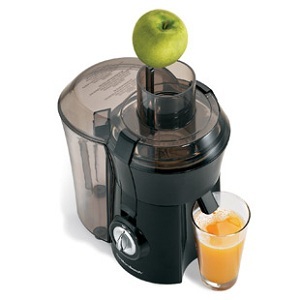 This juice extractor is a centrifugal juicer. This is a describes how the juicer uses spinning knife blades to process fruits and vegetables. A centrifugal juicer is much faster than a masticating unit is, but may compromise some of the juicing benefits in the process. It has a large 3-inch wide feeding chute. 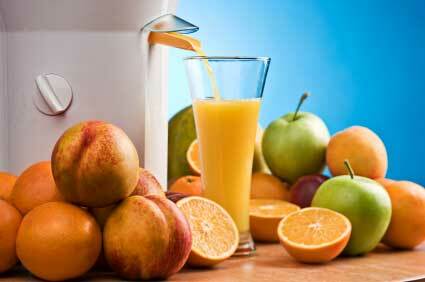 Many cheap juicers on the market today have smaller chutes which means chopping or cutting up your fruit. This Hamilton Beach model handles much larger pieces with ease cutting down on processing time. This juice extractor is generally easy to clean. This unit is completely dishwasher friendly and comes with a handy removable pulp bin. Many people avoid creating healthier dishes simply because clean up can be such a pain. This is not a problem with this juicer. It is easy to assemble. Right out of the box this unit is simple to assemble and use, which is a refreshing change. There is much to love about the Hamilton Beach big mouth juicer. You have to keep in mind that this is a centrifugal juicer, which means it is going to be better for firm fruits and vegetables. It will process things like bananas, kiwi and watermelon but you will have better results from carrots, apples and similar hard produce. Overall, for the price this is an nice juicer machine. How Much to Expect to Pay? The Price is Right! High-end juicers can cost over $100 and some are above the $200 mark, at around $75 this is more affordable than many juice extractors. Where Can You Buy One? We found the best price at Amazon.com but generally you can find them around the same price at most retailers. Copyright © 2019 · BetterJuicers.com This site contains affiliate links, which means that if you click on one of the product links, we may receive commissions if you purchase something. However, we don't recommend anything we would not use or would LOVE to buy for ourselves.